For its second annual report on the European borders, Migreurop has chosen to emphasize three main steps of the fights led by the authorities against the candidates to migration: the controls of their movements, detention and deportation. Based on evidences from fact finding missions, the report gives dramatic examples of this war against migrants which implies a general decline of the law protecting the freedom and integrity of human beings. Denouncing the « externalization » process of the European union migratory policy, Migreurop shows how third countries are obliged, through the threat of the reconsideration of cooperation agreements and development aid, not only to readmit the migrants chased from Europe, but also to keep them on their own territory from travelling towards its doors. From Calais area in France to the edge of Turkey and the Adriatic sea, from the surroundings of Gibraltar to the Sahel Saharan desert and the new member states of eastern Europe, a subcontracting of migratory control is carried out in series, sometimes very far away from the Union but also within its territory, especially when it deals with sending asylum seekers from country to country considered as unwanted. A large population of exiles, from both sides of the European borders, is subjected to arbitrary incarceration, wandering, and the constant humiliation of a hostile environment. While for the first time since its beginning, the Frontex agency displays its rapid intervention military teams to face the “massive flow” of migrants at the Greek border as if they were dangerous enemies, the Migreurop report, strongly recalls that the right, admitted by international treaties, to leave a country and ask for protection from another, loses its meaning if the candidates to emigration or to asylum are put under house arrest or held up on their way. 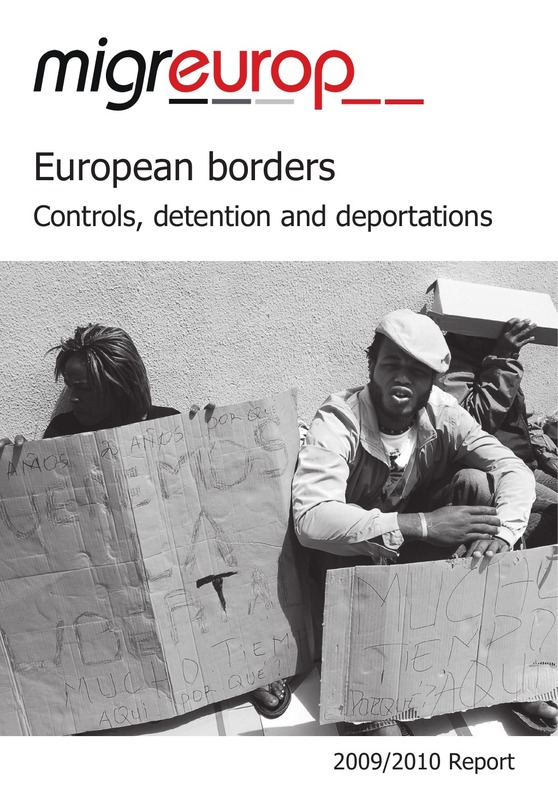 Migreurop, « European borders: controls, detention, deportations », 2009-2010 report, 128 pages. Available on line from 12 november 2010 on www.migreurop.org, in English, French, Spanish. Migreurop will organise a public presentation in Madrid, on the 12th of November 2010 from 10.00 am to 2.00 pm at Carlos III University and from 6.00 pm to 11.00 pm at FERINE.